Duplex stainless steel 2205 provides pitting and crevice corrosion resistance superior to 316L or 317L austenitic stainless steelin almost all corrosive media. It also has high corrosion and erosion fatigue properties as well as lower thermal expansion and higher thermal conductivity than austenitic. The yield strength is about twice that of austenitic stainless steel. This allows a designer to save weight and makes the alloy more cost competitive when compared to 316L or 317L. Because of its high chromium (22%), molybdenum (3%), and nitrogen (0.18%) contents, the corrosion resistance properties of 2205 are superior to that of 316L or 317L in most environments. The chromium, molybdenum, and nitrogen in 2205 also provide excellent resistance to pitting and crevice corrosion even in very oxidizing and acidic solutions. Chloride stress corrosion cracking of austenitic stainless steel can occur when the necessary conditions of temperature, tensile stress, oxygen, and chlorides are present. Since these conditions are not easily controlled, stress corrosion cracking has often been a barrier to utilizing 304L, 316L, or 317L. Duplex stainless steel 2205 combines high strength and high corrosion resistance to produce high corrosion fatigue strength. Applications in which processing equipment is subject to both an aggresively corrosive enviroment and to cycle loading can benefit from the properties of 2205. 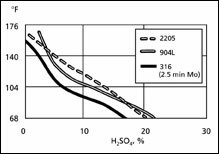 The chemical analysis of 2205 is optimized to obtain a typical 50 a/ 50 gmicrostructure after solution annealing treatment at 1900°/1922°F (1040°/1080°C). Heat treatments performed above 2000°F may result in an increase of ferrite content. Like all duplex stainless steels, 2205 is susceptible to precipitation of intermetallic phases, usually referred to as sigma phase. Intermetallic phases precipitate in the range of 1300°F to 1800°F, with the most rapid precipitation occurring at about 1600°F. Thus, it is prudent to have 2205 pass a test for the absence of intermetallic phases, such as those in ASTM A 923. Forming below 600°F is recommended whenever possible. When hot forming is required, the workpiece should be heated uniformly and worked in the range of 1750 to 2250°F. 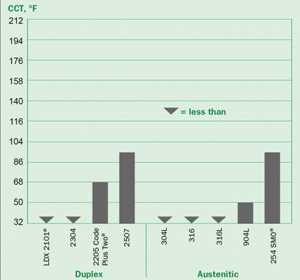 Duplex stainless steel 2205 is quite soft at these temperatures and is readily formed. Above this range, 2205 is subject to hot tearing. Immediately below this range, the austenite becomes substantially stronger than the ferrite and may cause cracking, a particular danger to “cold” edges. Below 1700°F there can be rapid formation of intermetallic phases because of the combination of temperature and deformation. Whenever hot forming is done, it should be followed by a full solution anneal at 1900°F minimum and rapid quench to restore phase balance, toughness, and corrosion resistance. Stress relieving is not required or recommended; however, if it must be performed, the material should receive a full solution anneal at 1900°F minimum, followed by rapid cooling or water quenching. Duplex stainless steel 2205 is readily sheared and cold formed on equipment suited to working stainless steels. However, because of the high strength and rapid work hardening of 2205, forces substantially higher than those for austenitic steels are required to cold form 2205. Also because of the high strength, a somewhat larger allowance must be made for springback. 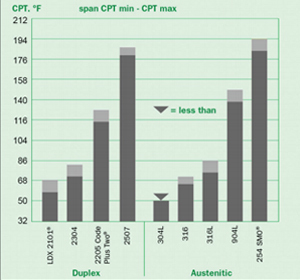 Duplex stainless steel 2205 should be annealed at 1900°F minimum, followed by rapid cooling, ideally by water quenching. This treatment applies to both solution annealing and stress relieving. Stress relief treatments at any lower temperature carry the risk of precipitation of detrimental intermetallic or nonmetallic phases. With high-speed steel tooling, 2205 may be machined at the same feeds and speeds as Alloy 316L. When carbide tooling is used, cutting speeds should be reduced by about 20% relative to the speeds for Alloy 316L. Powerful machines and rigid mounting of tools and parts are essential. Duplex stainless steel 2205 possesses good weldability. The goal of welding 2205 is that the weld metal and heat-affected zone (HAZ) retain the corrosion resistance, strength, and toughness of the base metal. The welding of 2205 is not difficult, but it is necessary to design welding procedures that lead to a favorable phase balance after welding and will avoid precipitation of detrimental intermetallic or nonmetallic phases. 2205 can be welded by: GTAW (TIG); GMAW (MIG); SMAW ("stick" electrode); SAW; FCW; and PAW. For more information on this source please visit https://www.yaang.com/ .